This study evaluates figure and form in contemporary poetry, especially the powers of simile and simile-like structures. Examining the works of Nemerov, Wilbur, Bowers, Hecht, Justice, Cunningham, Bishop, Van Duyn, Hollander, Pack, Kennedy, Ammons, Creeley, and Wright, Prunty argues that doubts about language, the tradition, and theistic assumptions embedded in the tradition have made simile and v… arious simile-like arrangements into major modes of thought. From Lowell's early interest in the "e;similitudo"e; and the "e;phantasm"e; of Gilson, to Husserl's "e;phantasies"e; and Heidegger's interest in similitude, to the use made by contemporary poets of simile, he shows that metaphor--together with slippage, mimicry, synaphea, conjunctions, anacoluthon, chiasmus, and other simile-like patternings--have proven to be more trustworthy than symbol and allegory. 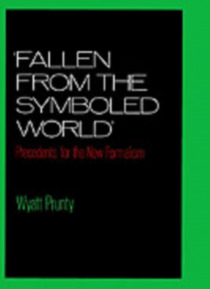 Throughout the study, Prunty demonstrates that as uncertainty about language has changed from a predicament of mind to a new way of thinking, simile and simile-like occurrences have provided poetry with variational thought and constitutive power.